#DVpit is Back on October 5th and 6th! After the success of the first #DVpit event in April, #DVpit is back for another round of Twitter pitching fun on October 5th and 6th! If you’re unfamiliar with this event, #DVpit is a Twitter pitch contest created to showcase pitches by marginalized voices and help connect them to agents and editors. While the number of diverse books is increasing, the number of new diverse authors entering the field remains low. Significant barriers remain for authors of color, Native authors, disabled authors, and other marginalized voices. With that in mind, we are excited to share information on this special Twitter event! The information below is cross-posted with permission from literary agent Beth Phelan’s #DVpit website. Change the query to “how to get a children’s book published” and the results aren’t much better. Eventually you may stumble on the helpful Frequently Asked Questions page for the Society of Children’s Book Writers and Illustrators (SCBWI), an excellent resource for new writers looking to improve their craft and figure out the publication process. But navigating all the resources out there, good and bad, can be tricky. On this blog we’ve often discussed our own New Voices and New Visions awards for unpublished authors of color. Today we wanted to spotlight another great award specifically for authors of color: the On-The-Verge Emerging Voices Award from the Society of Children’s Book Writers and Illustrators (SCBWI). We interviewed Lin Oliver, Executive Director of SCBWI, about the creation of the award and the role of SCBWI in diversifying the world of children’s book publishing. Stacy Whitman is Editorial Director and Publisher of Tu Books, an imprint of LEE & LOW BOOKS that publishes diverse science fiction and fantasy for middle grade and young adult readers. Parts of this blog post were originally posted at her blog, Stacy Whitman’s Grimoire. Last week, I discussed why worldbuilding in speculative fiction can be so challenging for authors. How do we introduce a completely new world without infodumping or confusing readers? I gave some examples of worldbuilding done well in popular YA science fiction and fantasy: The Hunger Games, Divergent, and Twilight. In all these cases, the starting point is in some way relatable, or there is something about the character (Tris, Katniss) that hooks the reader. First pages should be character- and plot-driven, and worldbuilding should support rather than dominate. That gives these books an easy entry point and wide appeal. Readers of Harry Potter, Percy Jackson, and Twilight figure out the world alongside the main character. Information is spooled out as the character learns it, so the reader doesn’t have to absorb everything at once. This is a low bar for entry, not requiring much synthesis of information. The character is almost a stand-in for the reader. What about Hunger Games? Now it gets a little tougher. Suzanne Collins starts out with a perfectly relatable (if a tiny bit cliche) situation, the main character waking up and seeing her family. We get some exposition on Katniss’s family and the cat who hates her. But it becomes non-cliche by page 2, when we learn about the Reaping. Ah! What’s the Reaping, you ask? We don’t know yet. Now the bar for entry is raised. There is a question, the answer for which you’re going to have to read further to find out. The infodumpage level is low, but there is still some exposition in the next few pages, letting us know that Katniss lives in a place called District 12, nicknamed the Seam, and that her town is enclosed by a fence that is sometimes electrified—and which is supposed to be electrified all the time. During the first week of June, I attended the Asian Festival of Children’s Content in Singapore. At the conference, I met writers from all over Asia and the Pacific, discussing craft, marketing their books at home and abroad, and translation. I even ran into Mark Greenwood and Frané Lessac, the Australian author/illustrator team behind the LEE & LOW picture book The Drummer Boy of John John. I enjoyed all the panels and the chance to see Singapore and meet so many people from the other side of the world—it gives you a perspective as an editor you might not otherwise have. One of the panels I participated in was a First Pages event, in which I read about 20 first pages of picture books, middle grade, and YA novels and then gave feedback on whether the pages were working for me and if I’d want to read more. Stacy Whitman is Editorial Director and Publisher of Tu Books, an imprint of LEE & LOW BOOKS that publishes diverse science fiction and fantasy for middle grade and young adult readers. This blog post was originally posted at her blog, Stacy Whitman’s Grimoire. This is actually one of the things I hated most about the famous adult fantasy series Wheel of Time, though I love the series in general: I hated the amount of time spent on this Forsaken’s love of naked mindless servants, and that Forsaken’s love of skinning people, or whatever. Yeah, yeah, I get it, they’re irredeemably evil. Get back to someone I’m actually ROOTING FOR, which is why I’m reading the book! Andrea Cheng is the author of several critically-acclaimed books for young readers. Her most recent novel, Etched in Clay, tells the story in verse of Dave the Potter, an enslaved man, poet, and master craftsperson whose jars (many of which are inscribed with his poetry and writings) are among the most sought-after pieces of Edgefield pottery. Etched in Clay recently won the Lee Bennett Hopkins Poetry Award. When I heard an NPR review of Leonard Todd’s book, Carolina Clay, I knew that Dave’s was a story I wanted to tell. And from the start, I knew that I wanted to tell it in verse. Readers often ask me why. I didn’t make this decision consciously, but subconsciously, I think there were reasons. The evidence of Dave’s life is fragmentary: pots and shards and bills of sale. This means that each small piece of evidence stands for something more, something much larger than the object itself. For example, the first bill of sale shows that Harvey Drake purchased a teenage boy for six hundred dollars. He was “country born” with “good teeth” and “a straight back. “ (Etched in Clay, p. 7) There is so much sorrow in these few words. A person is being evaluated and then sold like an animal. After a quick transaction, he becomes the property of someone else. The only way I know to allow a reader to feel this sorrow is through the intensity of a poem. New Voices Award Winners: Where Are They Now? Last month we brought together past New Voices Award winners to see what it was like to publish their first books. Today, in our final installment in the series, we ask these talented authors to share what they have been doing since entering the contest. This year marks our 14th annual New Voices Award writing contest. Every year, LEE & LOW BOOKS gives the New Voices Award to a debut author of color for a picture book manuscript. The submission deadline this year is September 30, 2013, so get those manuscripts in! Q: What have you been up to in the time since your book won the New Voices Award or Honor? 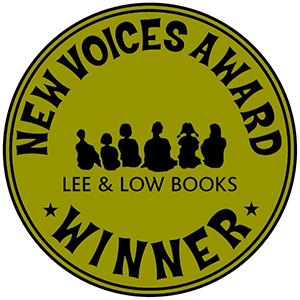 Winning the first New Voices Award for The Blue Roses gave me something I didn’t have before: confidence in myself as a writer. I had had a distinguished teaching career, but as a fledgling writer, it seemed I’d never get out of the slush pile. After the New Voices Award, my book also garnered the Paterson Prize and Wordcraft Circle of Native Writers and Storytellers Children’s Book of the Year. Buoyed by this incredible good luck, I wrote more and queried more. Though not represented by an agent at that time, I was lucky again and found a publishing home with the University of New Mexico Press for my next two picture books. The UNMP editor I worked with, W. Clark Whitehorn, convinced me to do my own illustrations for both Powwow’s Coming and Giveaways: An ABC Book of Loanwords from the Americas. Recently I’ve written and illustrated my fourth picture book, Boy and Poi Poi Puppy from Progressive Rising Phoenix Press and signed with Terrie Wolf of AKA Literary for my YA novel. I’ve been very lucky and thank Lee & Low Books for believing in me and for the wonderful jump-start!